24 Play Along Standards and Rhythm Section Alto Saxophone, Book with Downloads. 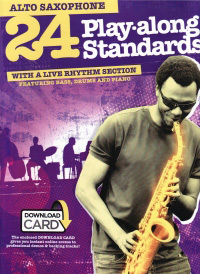 Take centre stage and play along with a live rhythm section.This collection features 24 great songs, from Jazz and Blues standards through to Soul and Gospel favourites and lively Swing and Latin numbers. The backing tracks will help you achieve a more professional performance. Songs inc, Birdland, Lean on Me, Knock on Wood, Tuxedo Junction, Son of a Preacher Man, I Get the Sweetest Feeling, Satin Doll, and More.